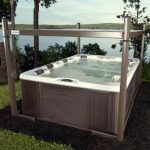 Use this Spa Planning Checklist to make sure the installation process is as smooth as possible. 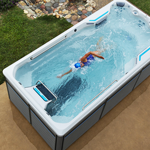 If you have any questions about any aspect of hot tub or swim spa installation, don’t hesitate to give us a call, send us an email, or drop by the showroom. A site within ten feet of your door will ensure you enjoy your spa more often. Choose a spot that can support a water-filled spa, which depending on size can range from 2,000 to nearly 8,000 pounds. An even surface with proper slope drainage will allow rain and splashing water to flow away from the foundation. Ensure that walls or structures do not block the door to spa components, allowing easy access for maintenance. What will you see from your spa? A well-landscaped yard or a blank wall? The right view can enhance your spa experience. Consider your privacy. Trees, shrubs, and fences offer screening so you can better enjoy your backyard retreat. 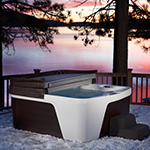 If you aren’t sure whether a hot tub will fit, call your local dealer for a free consultation. Choose a location away from falling leaves and other debris. Avoid a place where rain gutters may overflow or where wind tends to deposit yard material. Lay a clear path to prevent feet from tracking dirt and grit into your spa. A reinforced concrete slab that is at least 4 inches thick, which can support at least 120 pounds per square foot. 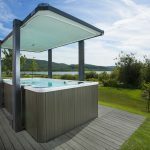 A prefabricated spa pad made of interlocking pieces combines strength with convenience. A gravel base can provide an affordable option. A deck can support a spa; consult with structural engineer or contractor. Engage a licensed electrician to install a manual disconnect device no more than five feet from your spa. Use your tape measure to plan a delivery route from where the spa will be taken off the truck to its final location. 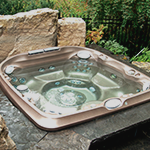 Determine the outside dimensions of your hot tub, including any protective material to ensure it will fit through gates, doors, steps and eaves. Measure the width of any gates, doors and steps. Take note of gas or water meters or air conditioning units along the path. Measure the clearance under the eaves as well as any overhanging tree branches.